A total of 41 students (of which 31 girls) sat the School Leaving Certificate exam in March. The majority of these young adults have now enrolled on further education courses. We presently have 29 students studying in class 10, 44 students studying in +2 (college courses) and 29 students studying at university level. 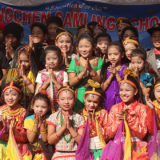 Out of 18 children from Gangchen Samling School who sat the School Leaving Certificate 1 student received an A+, 12 received A and the remaining 5 got B+. We are very proud of their achievements and the fact that we have been able to support these children from the very beginning of their education. 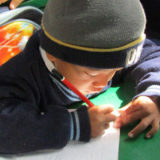 We have many children applying for sponsorship, so please contact us if you can help! We also continue to help the elderly people and families with disabled children through the long distance adoptions project. This support is indispensable to these people as there is no form of social assistance. 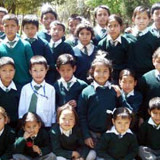 We presently have 230 sponsors supporting children in the school. As the number of pupils in the school increase, at the start of this school year we financed the construction of 2 new classrooms to avoid overcrowding and to make sure the older students have an environment conducive to their studies. We also provided the funds to start a music and dance programme for all the students in the school. Many children in village schools have to study in miserable conditions so once again this year, we spread our help to support 305 children attending 3 village schools by giving them a years supply of school stationary. Although many village children are able to attend school – books and stationary are not provided which means they have to study without! Most of their parents, who have no monetary income and live by subsistence farming, are unable to provide them with this luxury. We also distributed stationary to the children of Jorpati orphanage, the Hope Foundation and the 51 young monks of Sed Gyued Monastery. For the second year we sponsored the Shree Jana Bhuwana Primary School in Shikharpur Village for this academic year to ensure that the 90 children that presently attend it will continue to receive an education. As well as stationary for the year Sed Gyued Monastery was provided with funds to pay the salary for two teachers as well as for more desks and benches for the mini-monk students. We were also recently able to provide the funds necessary to make a new well and hand pump for the monastery, which is home to 51 young monks under the age of 15. The hand pump is extremely necessary as the monastery is often left without water when their present pump doesn’t work due to the load shedding of electricity. At the beginning of the year as the winter cold set in we distributed much needed blankets to vulnerable families living in villages that were destroyed by the earthquake or to people who were forced to relocate due to damage and threat of landslides. Although we had shipped a number of blankets to Nepal, we also ordered blankets directly from producers in Nepal. This was aimed at giving people work and ensuring an income for people who desperately need it. 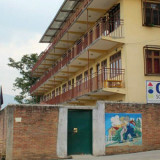 A temporary factory was also set up in Gangchen Drupkhang where hundreds of quilted blankets made. During the first distribution 1700 families in Bhumtang and Saamle villages received blankets. 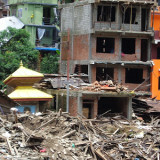 After this 700 families in (Sindupalchok district) received blankets and 1000 families in Mawakanpur. A number of other blankets were given to people in particular difficulties in and around the Kathmandu area. Particular care was always given to old and vulnerable people who also received winter coats. In November the Association was once again able to distribute shoes and clothing to families in Mawakanpur. Gangchen Drupkhang was built in 2006 with the aim of creating a base for activities and professional training in traditional Himalayan handicrafts and culture: hand carved furniture and decorative objects, traditional painting and artwork, healing incenses and herbal remedies of the ancient Tibetan tradition – a centuries-old heritage of the Himalayan medical culture. In recent years the centre has created very real opportunities for training, employment and social inclusion for some of the poorest people living in the outskirts of Kathmandu. 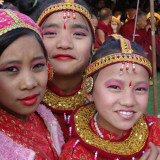 Particular attention is always given to mothers in difficulty, young people, unemployed with families to be supported and the disabled – offering to them a renewed sense of dignity and at the same time using and supporting the precious Himalayan artistic, spiritual, cultural and medical knowledge. The Gangchen Drupkhang building suffered severe structural damage during the 2015 earthquake – particularly to the ground and first floors – which made it completely inaccessible: there was damage to the supporting columns, the perimeter walls and even the internal stairs. After the immediate emergency had passed, plans for the reconstruction of the building were started. An Italian structural engineer, expert in post-earthquake reconstruction, was invited to the site and carried out an inspection of the building in June 2015. A fundraising campaign among our international supporters was coordinated, which allowed the work to be carried out. The activities were able to resume by the end of 2016. Special thanks to the Waldensian Church that sustained our fundraising project with the important amount of €64,000, allowing us to finish the work.